I have always been drawn to the beauty of Asia. 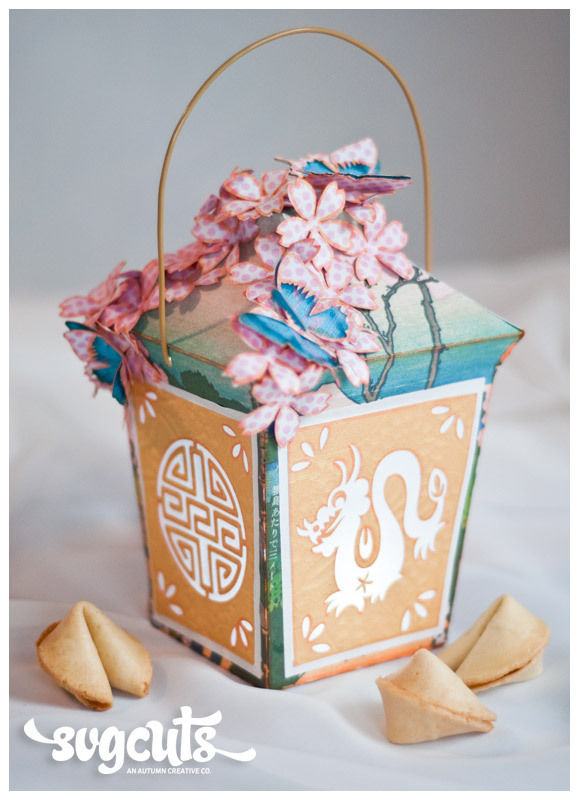 That’s what compelled me to design this paper lantern that is fun to make for Chinese New Year, to beautify your home or give as a gift. 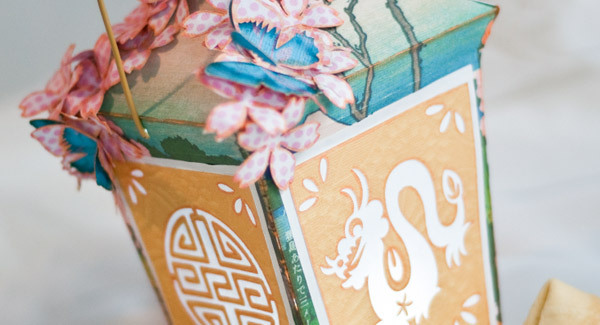 I gave this lantern the delicacy of Cherry Blossoms and butterflies with the strength of the dragon and tiger (yin and yang). I also incorporated delicate Asian designs. It’s fun, simple and beautiful. Optional – Copic Marker (R20 Light Pink) (YR12 Yellow Orange) (0-S Copic Sketch Marker Colorless Blender) You can substitute ink if you prefer. Glue the cut out window sections (gold paper) to the larger window sections (copy paper or velum). Assemble lantern as shown in Mary’s video ”Crisp Days Of Fall” the only difference will be the way you attach the window sections. Attach them on the outside rather than the inside. This will give you a nice white boarder around the edge. (I used copy paper for the window/velum sections, because I felt it gives it a true paper lantern look and you don’t have to make a special trip to the craft store for velum). Using your Copic markers or ink the sides of the lantern, window designs, flowers and butterflies to give added dimension. 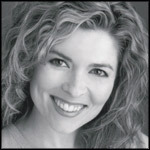 Curl your flowers – there is a great video demo by Mary on 3D flowers that gives great tips. Glue on your Cherry Blossom flowers, to the top of the lantern, draping and overlapping them for a 3D look. Glue your butterflies together, remember to only glue the center body section to give them a fluttery look. then glue them on. Use double sided paper on the flowers and butterflies, so the underside is just as pretty as the topside. I love using the Copic markers to edge my projects, as opposed to ink because, I have so much more control, it’s just so much easier (using the Copic blender on top of the marker, will really give it a beautiful blended look). I like to use copy paper instead of velum, because I always have it on hand and the light glows nicely thru it. I used Asian digital papers that I found at digitalscrapbookpages.com (Garden of Hope Art Papers for the body of the lantern (village scene), Garden of Hope Papers for the butterflies (blue with touches of pink) and (gold) for the window sections. I brightened these up in Photoshop. I used Digital paper from designhousedigital.com for the Cherry blossoms (Vintage Findings – Pink Paris Digital Papers By Jen Allyson) Pink polka-dot pattern. Using the digital papers gives you complete control over color and hue along with the ability to make any paper double sided. The SVGCuts “Crisp Days Of Fall” lantern lends itself to so many creative themes. It makes a great gift or just a beautiful piece to add to your home. 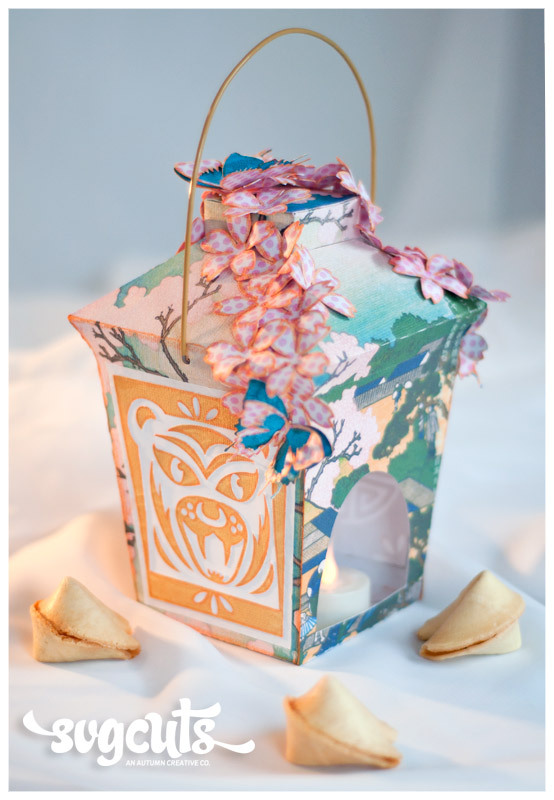 I hope you enjoy creating this Asian themed lantern as much as I did. If you make one, I would love to see it. Share it on the SVGcuts facebook page. Open your mind, be creative and have fun! Gorgeous lantern Fleurette! Love the cherry blossoms too. Beautiful project! My nieces have requested that we make some! OMG – so awesome…………….love, love, love this. In my mind, I always thought the lantern from the Crisp Days of Fall was the perfect element for the Asian theme. So perfect, to see this today: the first day of Chinese New Year (of the Dragon!!!) Thank you for sharing this project!!!! Awesome job!!! I am really inspired to make one of these now.